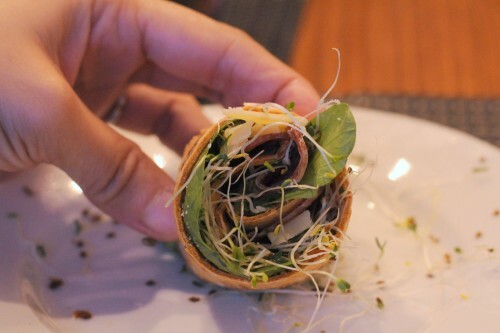 During a recent trip to Manila, I fell in love with what is supposedly a purely Philippine phenomenon: the panizza, thin crust pizza filled with greens and sprouts and rolled into a bite-size piece of crunch perfection. Having been unsuccessful at locating a nearby source for this creation in NYC, my good spouse decided that she would make one of her own. 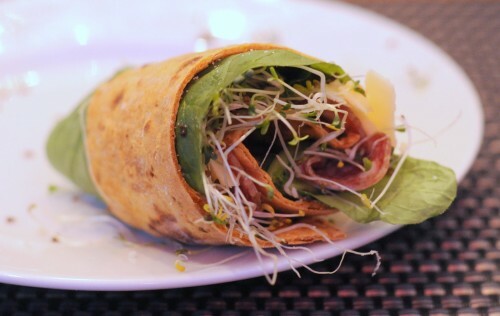 Enter the roll-up wrap which as available in grocery stores for use in making your more conventional wraps. On the package there is a photo of its use as pizza crust, which gave us the idea that we could create panizzas of our own. 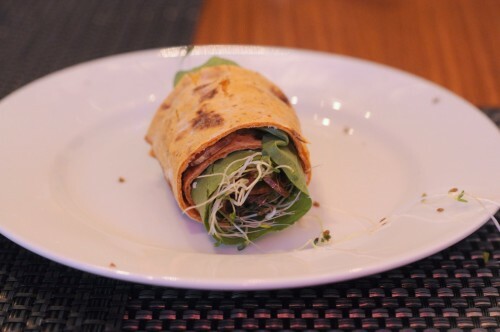 Cheese is melted onto the wrap in an oven, and then it is cut into strips. 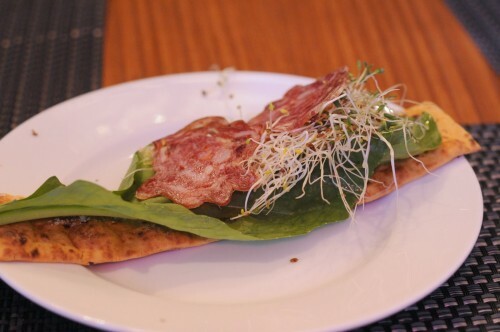 Fillings such as the above arugula, alfalfa sprouts, and our homemade sopressata are placed on top of the strip. The strip is then rolled tightly, showing its fillings in a concentric pattern. That definitely fits in my anxious mouth. Mangia! This entry was posted in meal ideas, Recipes and tagged homemade panizza, italian, panizza, soppresata on September 26, 2012 by admin.